The Apostolic Lutheran Church was organized in the United States in 1872, having its roots with a group of people who came from Finland, Sweden, and Norway in the 1860’s. The Apostolic Lutheran Church of America has 55 churches with about 9,000 members. Known in Scandinavia as the Laestadian Movement, this church started as a revival or awakening in the parish of Kaaresuvanto in the northernmost part of the State Church of Sweden. It received its name from the minister, Lars Levi Laestadius. The immigrants who brought this movement to America were of Laestadian Lutheran background in their home countries. At first they attended other Lutheran Synods in America, but they desired to organize a congregation of their own. In 1872, they organized a congregation “Salomon Korteniemi Lutheran Society” in Calumet, Michigan having called Salomon Korteniemi from Norway to be their minister. Other congregations followed under various names, primarily in Michigan, Minnesota, Oregon, and Washington. The name “Finnish Apostolic Lutheran Church of Calumet” was adopted in 1879 and this was the first use of “Apostolic Lutheran” in our name. Between 1892 and 1922 the original group divided into three main bodies. The Apostolic Lutheran Church of America is one of those starting in 1908. 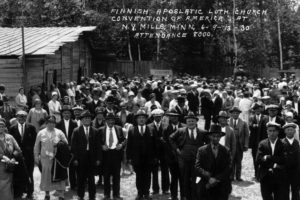 In 1928, the Finnish Apostolic Lutheran Church of America (Finnish was dropped in 1962) was officially incorporated under the laws of the State of Michigan and elected its first President, Pastor John Oberg, who served from 1928 to 1943. In 1943 Rev. Andrew Mickelsen became his successor serving until 1972. Others have followed him, chosen by the Central Board from among their members elected by the delegates at the Annual Business Meeting. Those that have served are Oscar Wilson, 1972- 1979; George Wilson, 1979-1987; Richard Sakrisson, 1987-1991; Ralph Davidson, 1991-1993; Earl Kaurala, 1993-1998; Richard Juuti, 1998 to 2007; Wilfred Sikkila, 2007 to 2015, Gary Bertram 2015 to present. All are ministers. Apostolic Lutheranism, as a whole, has been and still is mostly a lay movement with ministerial training not a pre-requisite for ordination to the ministry. Evidence of a “call by God to preach the Word” is the main criteria for ordination of the clergy and elders. The church buildings in which members worship are very simple in structure and beauty. The worship service consists of a simple liturgy. A typical worship service includes an opening hymn, prayer, a hymn and free will offering, a sermon from the Bible, communion, and a closing hymn and benediction. Each congregation in the Apostolic Lutheran Church is autonomous. The Apostolic Lutheran Federation presently has 43 ministers on the Ordained Ministerial Roll, 33 ministers on the Unordained Ministerial Roll. The Western Mission, the Eastern Mission and the Southern Mission coordinate domestic mission activities in the United States and Canada. The Foreign Mission sends missionaries to several other countries around the world. Other Federation activities include the National Sunday School, Book Concern, and a monthly publication of Christian writings called “The Christian Monthly”. An Annual Business Meeting is held at a location in the United States of America as decided upon at the prior Annual Business Meeting. Four days of worship services are conducted in conjunction with the Annual Business Meeting. The Apostolic Lutheran Church of America recognizes as true: the Christian Doctrine, based on the Old and New Testaments of the Holy Bible; the Lutheran Doctrine, the Book of Concord, and the three ecumenical symbols: the Apostolic, the Nicene, the Athanasian Creeds, and the Augsburg Confessions; (those parts) which are in agreement with the Holy Bible and uphold the Confession of True Faith, and love as the greatest law. All ritual and polity of the Church are to be governed according to the immovable truths of the above mentioned Confessions, namely, that the Holy Word of God (both the Old and New Testaments) shall be the sole authority of truth in the light of which all doctrine in this Church shall be examined and determined. The principal calling (duty) of this Church shall be the propagation of the true doctrine, which shall manifest itself in the preaching of repentance and the remission (forgiveness) of sins, and by the administration of the sacraments of Holy Baptism and the Lord’s Supper customarily practiced by the Apostolic Lutheran Churches. Cras egestas mattis bibendum. Etiam eget tellus massa. Nulla sit amet leo et nibh volutpat elementum. Aliquam est tortor, hendrerit at lacinia eu, pharetra sed diam. Nunc ut erat turpis, a aliquam libero. Nam semper pharetra enim vitae tincidunt. Curabitur eget eros leo. In sodales, quam in rutrum consectetur, metus dolor egestas mauris, nec aliquet enim elit sit amet metus. Aliquam sed urna turpis, ut mattis nunc. Proin vitae risus nisi. Vestibulum iaculis cursus semper. Morbi id lorem libero, quis. Nulla sed ligula nunc. Donec sed risus eget libero fringilla aliquam sit amet ac nibh. Nulla scelerisque, diam ac lacinia pellentesque. Fusce in metus orci, ac laoreet leo. In hac habitasse platea dictumst. Nullam condimentum velit a arcu accumsan in pretium. Phasellus nec magna nec enim egestas tincidunt. Quisque viverra scelerisque pulvinar. In pretium dignissim adipiscing.